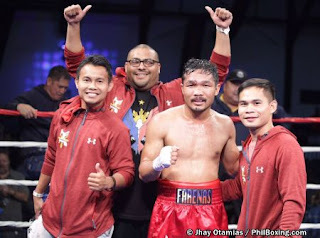 Filipino former world title challenger Michael "Hammer Fist" Farenas was successful in his comeback fight against Martin Angel Martinez at The Hangar, Costa Mesa, California, USA today June 2, 2017. The Filipino slugger dictated the fight in the early of the first round and scored a Knockdown. In round 2 Farenas continue to dominate his opponent and throws signature powerful punches against the Mexican. In third, Farenas finally dropped and stopped the Mexican at the 2:04 mark. Farenas finally came back after being halted for almost 2 years in boxing. Farenas improved his record to 42W(34KO)-5L-4D and he is looking forward to becoming a contender again.